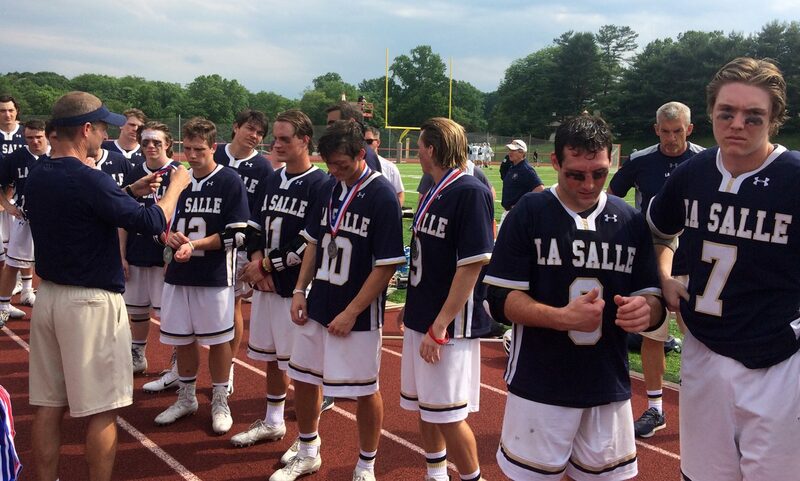 What a year it was for the La Salle College High School lacrosse squad. The Explorers claimed the PIAA District 12 title and earned their place in the PIAA Class 3A championship game but ultimately dropped a 6-4 decision to the Manheim Township Blue Streaks Saturday, June 9 at West Chester East High School. La Salle wraps up the 2018 season with a final record of 19-5. This was especially rough for juniors and seniors on the squad who faced the same heartbreaker in the 2016 loss to Springfield in this final round of the playoffs. The Explorers jumped off to a strong start in the championship game as Meagher tallied both goals for his team in the opening half and the score was tied, 2-2, at the conclusion of the half. La Salle faced some difficulty as the second half progressed, falling behind 4-2. Nevertheless the team kept battling and senior attack and midfielder Matt Clibanoff tallied a goal with 2:48 remaining in the third quarter for a 4-3 score. Junior attack Joey Taylor assisted on Clibanoff’s goal. The game continued to be a tight one though at a deficit for La Salle. Senior midfielder Ethan Lamond found the net with 2:45 in regulation and that cut Manheim Township’s lead to 5-4. Nevertheless, the Explorers gave up another goal that they were unable to claw back as the final buzzer sounded to call it a game. Goalkeeper Michael Clibanoff turned away five shots for La Salle. Face-offs combined with the Manheim Township defense were particularly tough on La Salle.